Just to re-iterate, this has spoilers about the latest Marvel comics story. Turn back if you’re easily offended by spoilers. Still here? 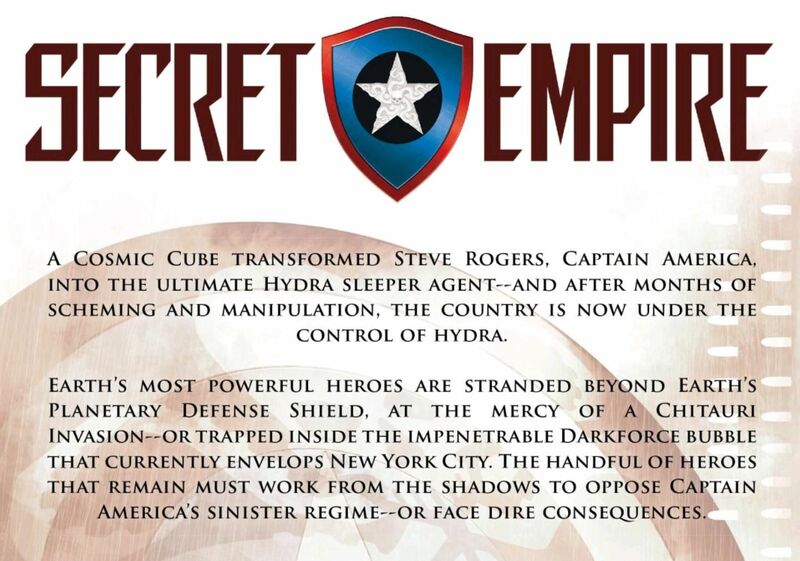 Cool, hopefully you’ve read the first issue, not including the “prequel” #0, of Marvel’s Secret Empire. 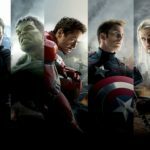 I’m also hoping you’ve read some of the major story lines leading up to it including, but not limited to, Captain America. If not, I’ll let the first page of the issue explain the situation better than I could. The issue starts with examples of how the world has changed for the public. History books now show that America lost World War II and a class full of children demonstrate that everyone has to salute and Hail Hydra regularly (we were doing that on our podcasts before it was cool.) 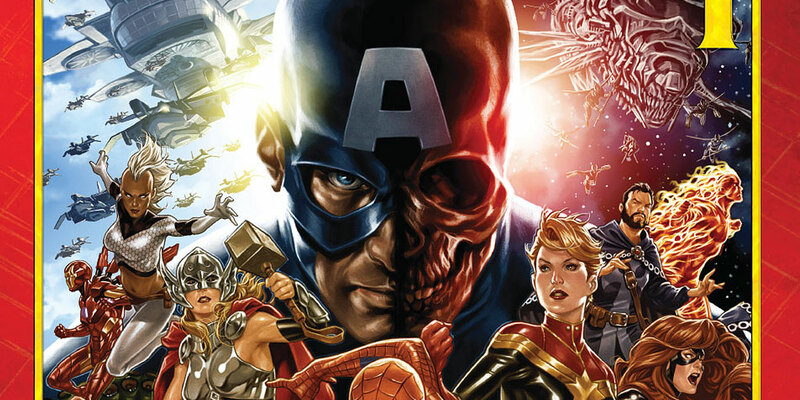 In the issue, Cap’s leadership is being called into question by his high council including Dr Faustus and Arnim Zola. They are pressuring him to go ahead with the execution of his friend to prove his strength. However, Steve knows that he’s damned if he does and damned if he doesn’t as his weakness will be demonstrated either way. 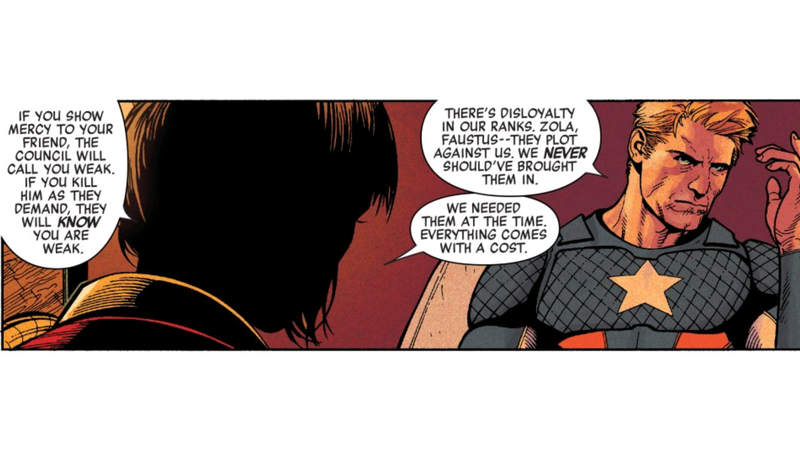 Cap seems almost desperate to let Rick go, and all Rick has to do is say “Hail Hydra.” As any hero would, Rick refuses but whether this is due to principles or due to naive faith that Captain America will save him is up for debate. 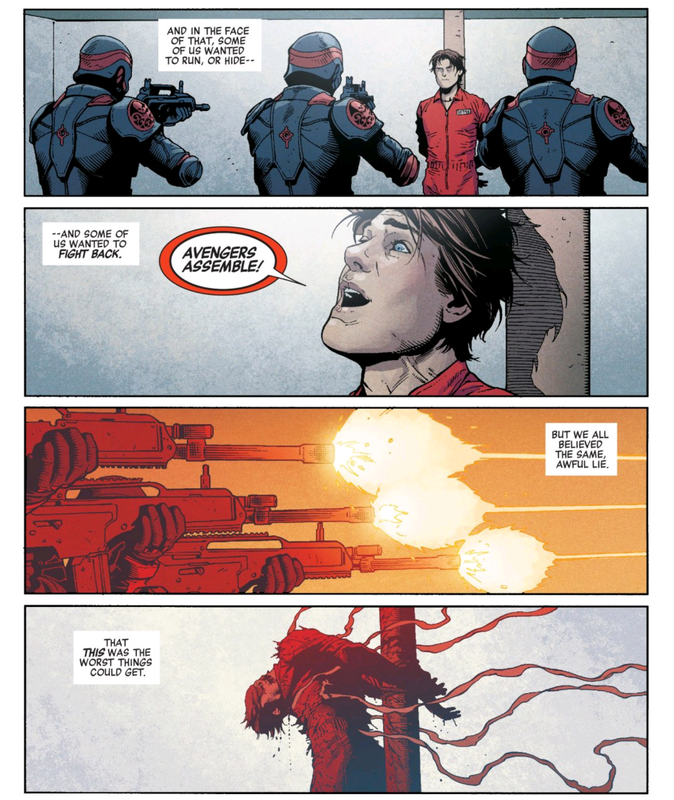 As the issue draws to a close, Rogers orders the execution and Rick Jones is killed by a firing squad, still managing to stick to his defiance to the end. Maybe he believed this was the old way where heroes swooped in at the last second, maybe he just wanted to stick it to Cap. Either way, it’s the last thing he does before he’s made less wind-resistant. So there you have it, Cap is in charge of America, Hydra rules, history has been changed to favour the victors and a mid-card hero has been given a high profile death. Bet that’s cheered you right up!